Look at any tech magazine or analyst report and you’ll probably read that social media (in addition to ‘big data’ and the ‘cloud’) being the panacea for all Internet business growing pains, but what the hell does that mean for you as a app startup?! Today I want to go a bit past where the Gartner vernacular stops and explore some of the ways you can design social media integration into your app to fuel user growth. In the words of H.G. 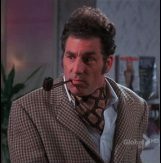 Pennypacker, a beloved industrialist, botanist and bicyclist, I want to get to the real gritty-gritty of the social media mess. Social media integration means more than blasting people’s wall’s with generic messages informing their friends that “Tobias just started using Grindr!”, or by simply enabling people to share app content on their Twitter or Facebook feed. No, you want to go deeper than this and create social media integration points that are designed to get people’s attention, lure them in and then BAM! Convert them into users of your app. It’s a no brainer that people should be able to share interesting things they see on your app to their social media feeds, but that’s just the first part of the equation. Once someone clicks on a tweet or wall post from your app they are going to land on a page on your website, this is your one chance to promote your app and entice them to download it! 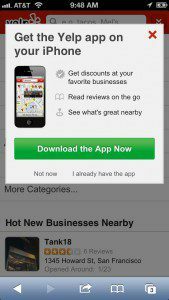 Create a banner advertisement or an other engaging display ad and make sure that whatever the user is viewing is complemented by a tasteful pitch of your app. The Facebook Activity Feed is another great outlet for you to promote your app by publishing actions people take in your app to their Facebook. No I am not talking about their wall, I am talking about that box in the upper-right corner which keeps you up to date on what the last song your Uncle Fred listened to on Spotify. Publishing to the Facebook Activity Stream greatly increases the number of random impressions of your app while limiting the social backlash that occurs when apps blast someone’s wall with updates. Plus, it requires no action on the part of the user besides their own use of the app. The beauty of the Facebook Activity Feed is that you’re opening the proverbial kimono of your app and exposing all the interesting, and fun things that are happening inside of it to the general public. 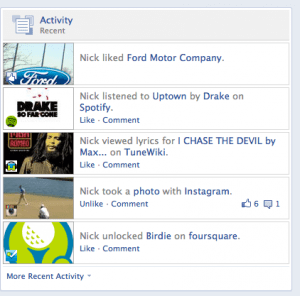 If someone sees an interesting thing popup on their activity feed they click it and boom, they are on your website. Use 1.) to then get the user to take the next step to download your app. Remember kids, privacy is the name of the game here. At the minimum you need to let your users turn off Facebook activity stream sharing if they’d like. Whether you enable Facebook activity stream sharing by default (ala Spotify) is a more ethically gray question. If you are creating a game, or an app that has some direct social interaction (i.e. DrawSomething, Chess, etc…) then use social media as the invitation mechanism for people to invite their friends to join them in an match/game/etc.. on the app. Note the last part, do not spam someone’s friends list with “come play Farmville with me!” type of posts. No, what I mean is give people the ability from within your to app to challenge/invite/start a match with their Facebook/Twitter friends. When your app user picks a Facebook friend to play against, your app invites the Facebook friend to start playing with their friend with a Facebook invitation. Your job as an appster doesn’t stop with the invitation. No my friends, in order to make invitations generate real user growth you need to close the loop and enable a frictionless journey from an invitation to a user of your app. So when an invited user clicks on an invitation, they should be able to download your app, sign in with their Facebook credentials and immediately begin playing against their friend. If you can execute this loop and make it drop dead simple for some random schmo on Facebook to begin interacting with their friend on your app then you are creating a potentially explosive viral loop that can spread your app right across the Facebook landscape. There is a subtle yet critical difference between an invitation to play versus a invitation to download. A random Facebook user is more likely to click on something that is targeted directly to them and invites them to engage with one of their existing friends. Remember the first time someone invited you to play DrawSomething with them on Facebook? On the other hand, an invitation to download is impersonal and borderline spammy which is likely to result in a bunch of people choosing to “ignore all posts by X”, which is the last thing you want people to be doing with your app. Phew, that was a long one! I’ve only touched the surface of how to integrate social media into your app’s functionality, there are many other avenues and strategies you can employ to help drive user growth of your app, these are but some of the ones I’ve used. 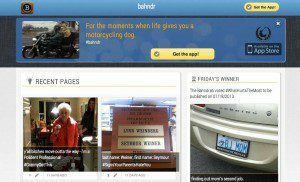 Do you have other ways to leverage social media to fuel user growth? Let us know and post your ideas below!